Rua's West End Pizzeria has been serving up delicious Italian favorites to the community of New Bedford, Massachusetts since 1993. We offer pizza, subs, spaghetti, and a variety of dinner plates, all made fresh to order with high-quality ingredients. Dine in, carry out, or ask for local-area delivery today! Rua’s West End Pizzeria has been serving up delicious Italian favorites to the community of New Bedford, Massachusetts since 1993. 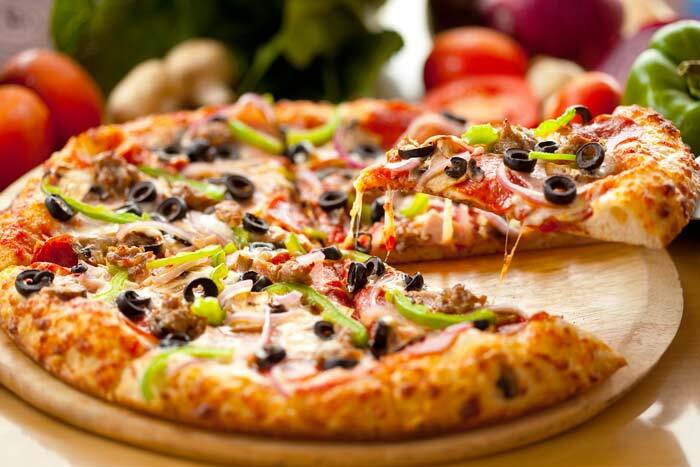 We offer pizza, subs, spaghetti and a variety of dinner plates, all made fresh to order with high-quality ingredients. Dine in, carry out, or ask for local-area delivery today! Looking for a place to get great food, at a great price, prepared fresh to order? Stop by Rua’s West End Pizzeria to get your hands (and your taste buds) on some of the best pizza in New Bedford, MA! We hand-make all of our pizzas, pile on an assortment of fresh toppings and bake them to perfection, giving you a classic Italian meal that’ll leave you with a full stomach and a happy palate. From classic favorites like cheese, pepperoni or Italian sausage, to specialty pizzas like our 7-topping creation or our buffalo chicken pizza, we’ve got flavors to satisfy any craving. Dine in, carry out or ask us about pizza delivery in New Bedford, MA (up to 2-miles). In addition to pizza we’re the premier destination for authentic Italian sub sandwiches, dinner plates and spaghetti. Grab one of our massive 12” subs with both hands and hold on for the flavor ride, or twirl up a hearty portion of pasta and satisfy your craving for Italian food the right way. You can’t go wrong with any of our menu items, heartily portioned for a great price. Whether it’s a lunch time craving or you’re hosting a party full of hungry people, Rua’s West End Pizzeria is ready to serve any appetite! We offer delivery within a 2-mile radius of our restaurant. Our business has been serving up delicious Italian favorites since 1993! We’re locally-owned-and–operated, and have become a fan favorite for pizza and subs! We use only the highest quality ingredients and prepare every meal with care. It’s our mission to bring you great food at great prices. If you’re craving delicious pizza or want to unwrap a delectable sub, get in touch with us today! We’ll make your food to order and deliver it quickly, to satisfy your craving for great food.